A worrying week with a bad weather forecast for the day of the Graham White Pairs Strokeplay event. 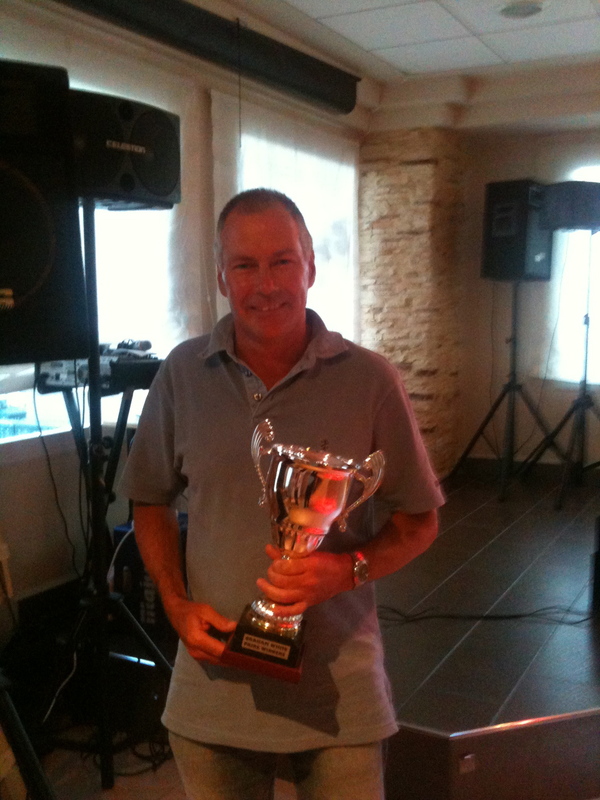 On Monday we had only 17 entries for this 2nd major of the year, and about 32 for the evening presentation at Trevis. After a hectic wednesday night meeting we finished up with 59 entries and 82 booked for friday night. We ran out of times and had a reserve list, but I managed to get 2 more starting times thursday morning to accomodate everyone. On that note, can players enter ASAP so we know how many times to book. Olagolf expect us to know how many times we need in advance although many of our members dont arrive until the last minute. Also there has always been a problem with who can have a buggy even though it is stated as included in the price for non olagolf members. So from next week any player wanting a buggy must put (B) at the side of their name. Then depending on the buggies we are allowed (total paying players/2) players can ask on the day until our allowance is gone. Now it is getting busy at the wednesday night meeting book with Barry, give entry money to Graham and pay membership fees to Phil as it is getting a bit chaotic! The format of drawing partners seemed to go down well with comments about making new friends, but it was difficult to organise and so will only be an occasional format. As a major, rules meant that all entrants must have played at least one previous individual competition with us. As a result, we arranged an individual competition for all those not qualifying and others who didn’t fancy the possibility of letting partners down. So we started Friday with 21 in the individual and 38 in the major. Amazingly, the weather was perfect apart from the wind which got up later. After the rains we suffered the previous 2 days the greens were true but easy paced. It seemed that the rough had grown another foot causing delays as players searched for balls. In the end we had some great scores in the main competition with the winning total being hard to believe! 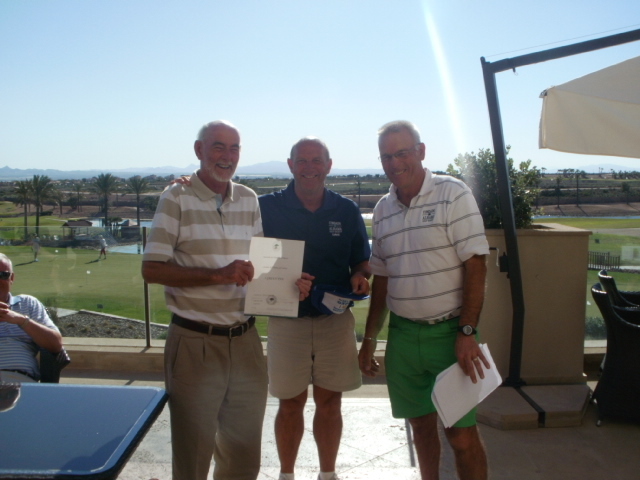 Again it was that man Terry Burgess taking the honours along with his norwegian partner Frode Overli. The evening party was a great success starting with the presentation of the annual trophy and replicas followed by a free draw for attending members with over 20 donated prizes supplied by Graham White, Nigel Ford, Condado Golf Club Hire, Kev & Cath Smith, Phil & Lesley Tann and Trevi’s bar. David Wareing won a burglar alarm which I later stole. It didn’t go off. 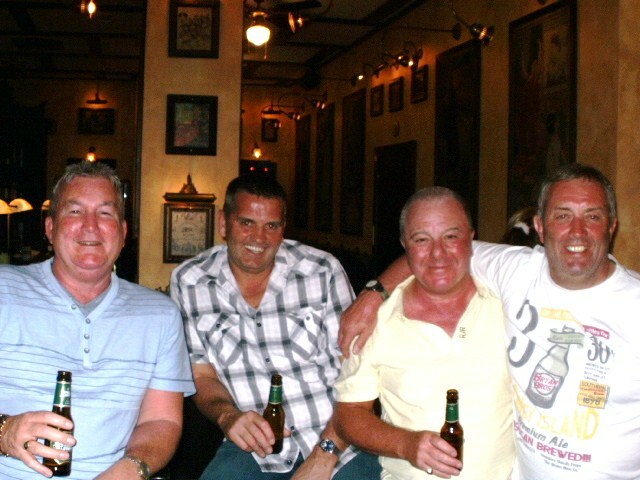 Everyone enjoyed the singing from El Tel and the great hot buffet. This was our biggest social event yet and these get togethers are proving very popular. It gets the residents and friends of Condado together and fosters the community spirit that we need. We all give thanks to Cath and Kevin for the hard work they put in organising the night and transport. The resort has been very busy this week with lots of spanish visitors here for the main religious festival of Easter. Unfortunately the restaurant has just opened and they still have not got their act together with prospective customers being told there was a 2 hour wait! Hoping to have a meeting with Olagolf this week to raise our concerns. Had 77 players last week monday and friday and that needs recognising. Breaking news – no official announcement about summer prices but bookings are being taken at 50 euros for visitors (15 euro reduction?) and 45 euros for residents. Another reason why we need a meeting – no price given for us. We have just decided the date for the 2011 Viking Cup (UK are holders!). It will be played on Tuesday October 25th at Condado. There is a big party of vikings coming over on their longboats intent on taking the cup from us. UK team try to be here for that date but lock up your wives and daughters! Next week we are back to an individual stableford event. 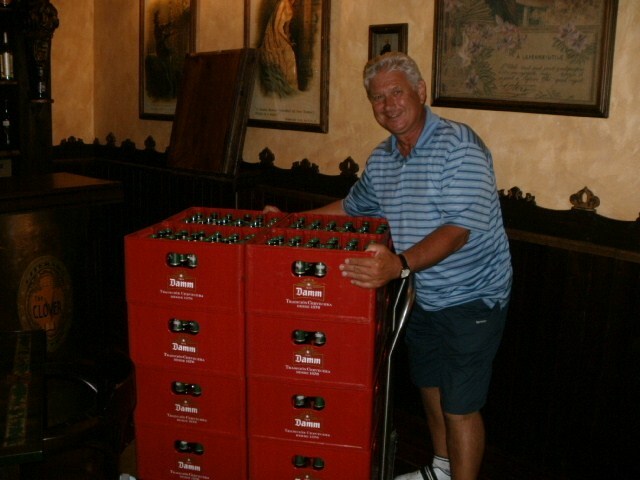 45 cards recieved for the individual stableford this week with another 5 not returned. Played under some cloud cover it was a pleasant day with wind (as usual) affecting the later starters. Even with so many players nearly all cards were not as good as players would have liked. 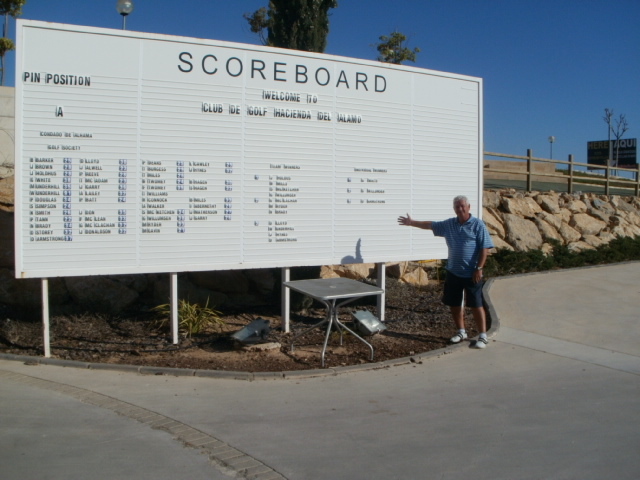 This weekend is the Canal+ two day competition and Monday is the Murcian PGA pro comp. The greenstaff have done an excellent job of preparing the course. I am very sad to report the loss of one of our members Daniel Pilkington, who passed away recently after a short illness at the age of 30. Our thoughts are with his family and friends. Bonus ball winner this week was Maria from La Isla with number 46. A last reminder to get entries in for the Graham White pairs strokeplay championship. Times and pairings will be drawn on wednesday night at 7pm. This week was a team event with 3 players in each team, the best 2 scores at each hole to count. We had a great entry of 48 players, plus 5 more who had joined as members but did not want to enter the competition. PLease note this is possible if your game isn’t up to competition level or you just want a friendly 4 ball with your friends. Every week numbers are growing, and I can see a new record of perhaps 80 compettitors during the summer. Also we are now getting between 20 and 30 for our informal roll up on Mondays. After only 5 weeks we now have about 240 paid up members. A great score by the winning team. The weather for the competition was sunny and a comfortable 78 degrees (in the shade). As a spectator I could see many players searching in the now thick grass in the 2nd cut of rough. At the moment it is quite short but when summer comes I can see us losing the ‘meerkat’ (Ian) in it! Olagolf are employing 2 golf professionals from Hacienda del Alamo to give a short game clinic (is it in response to my complaint we had no clubhouse, golf director or pro?). It does look very expensive though at 50 euros a head for a clinic style format. Still no sign of the temporary clubhouse we were promised. i have asked for a meeting with Olagolf next week to discuss various issues. 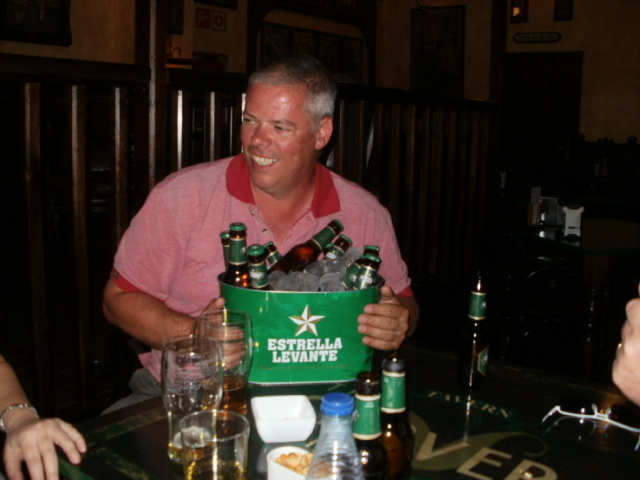 I have noticed that Kennellys golf society have now made their base at Hacienda who appear to be cleaning up the society golfers with their 35 euro society deals. Are Ologolf missing a trick here? Not much news this week just reminders that the Graham White pairs strokeplay major championship will be on Good Friday April 22nd. 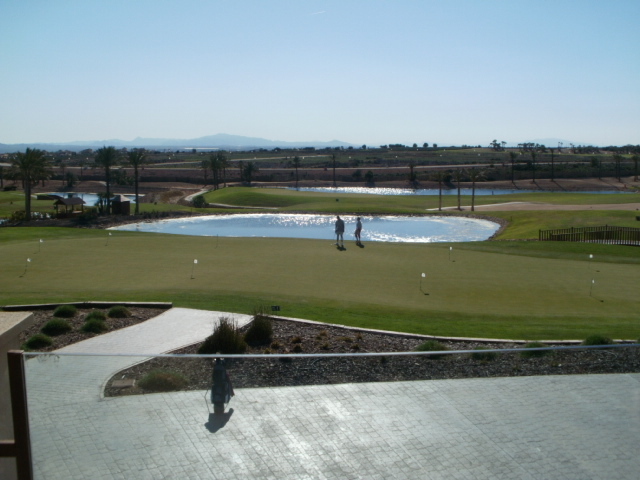 On Monday April 18th there is the Murcian PGA championship, and next Friday we have our individual stableford. I have been saving a little snippet for a quiet week like this – I am sure any golfer who has played Condado realises that the hole stroke index is a complete farce? The difficult 200 yd plus par 3’s are rated as the easiest holes and the par 5’s the hardest? A few weeks ago I made my own analysis from checking the cards of 18 single figure golfers (should be scratch or pros but we don’t have those). These 8 holes were all the biggest movers. As a matter of interest the hardest hole based on scores to par was that devil over the lake on the 11th! Also amazingly, 8 of the 9 hardest holes were on the back 9! I had to split these up those on the new index alternating odd and even numbered indexes. Just a bit a fun but I would guess they wont be too far out if a proper study was made. 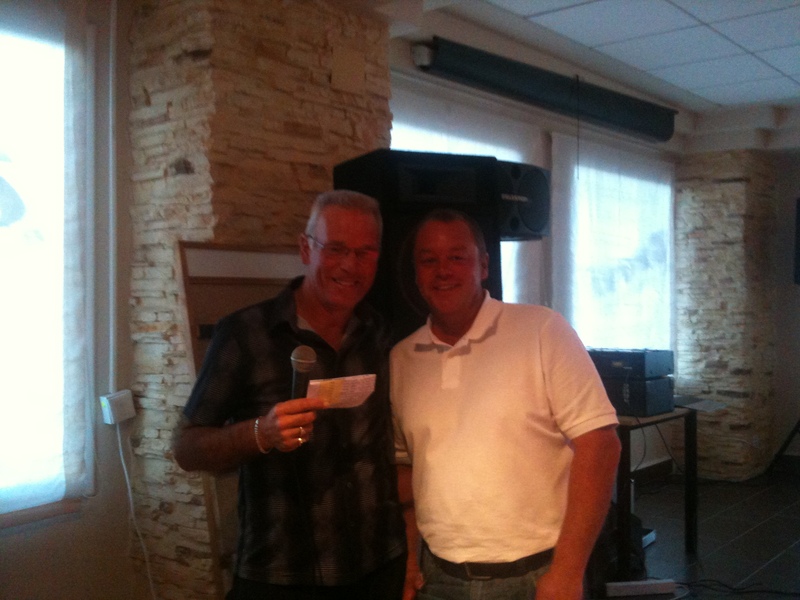 The winning bonus ball number this week was 22 won by Kevin Smith. Today was the awayday at Hacienda del Alamo and it did not disappoint. 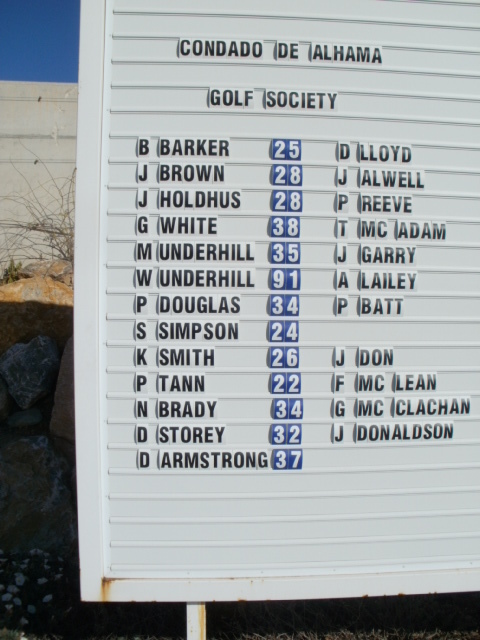 We finished up with 42 players playing individual stableford with a twist…… no individual prizes but the scores of the 3 best players in each flight were added to get a team total. This did confuse many although all the rules were posted on the notice board and website. 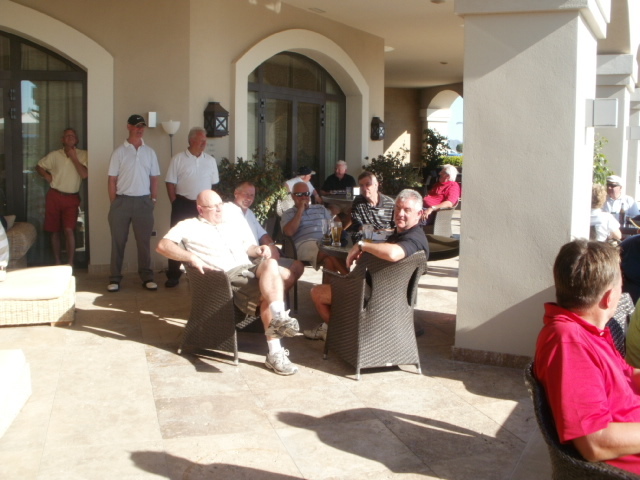 The notice did say meet in the bar at 9am but many went straight to the academy course for the short game competition and when they came back the organisers were on the course. However, everyone enjoyed the day no matter how good or bad their score was. The course was in excellent condition, the sun shone and there was little wind. It was a nice touch to see the scores on the leader board by the 18th green. Notice on the photo that Will had a great score of 91 pts. We think perhaps he may may tampered with the numbers 1 and 6 which were actally on his card! It was great to sit on the beautiful terrace with friends and a drink in your hand looking at the fabulous views. Some players were unhappy with being drawn out but just for a change it was good to meet new people and it does develop our community spirit. Generally though players will be able to pick their own partners as the majority prefer it that way. Anyone without partners will always be fixed up. Hacienda kindly gave us two green fee vouchers towards the prizes. We had a card draw out for these and the winners were Peter Deans and Paul Douglas. So 14 of the 42 players received a prize. We have made another booking for May 27th when Condado is closed for course maintenance. Next week is a 3 person team event with 2 stableford scores to count at each hole. I have posted Hacienda’s contact details on the notice board for anyone who wants to take advantage of the 35 euro deal we have made for our members. Always contact them first and take your membership card and handicap certificate with you. If you haven’t got one they are available from me. I have decided to make captains day one round only as the cost of 2 rounds may put players off. On Monday May 2nd we shall have a friendly competition to mark my captain’s drive in. I aim to introduce another major competition to run alonside the Barry Barker individual strokeplay championship on July 15th. We will have a scratch cup that day where every shot counts and the winner will be the player who takes the least shots – no handicap allowance. I know everyone can’t be here but whenever it is played someone will miss out. 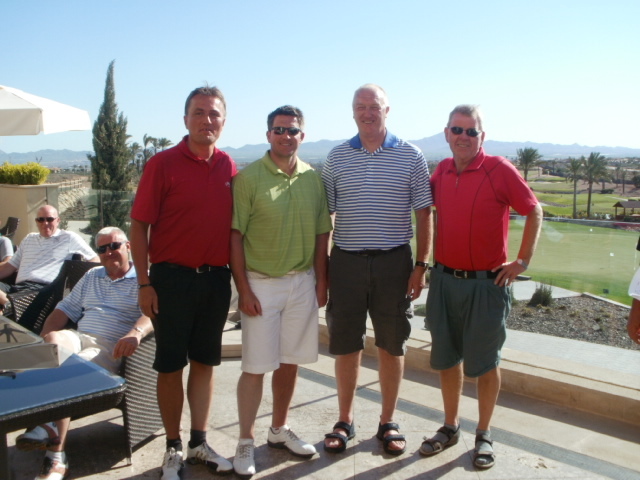 The challenge against Mar Menor will be at Saurines de la Torre on Monday May 9th. At the moment we are looking at teams of 20 with maybe 4 of those ladies. This number may be flexible if we have a lot of interest. 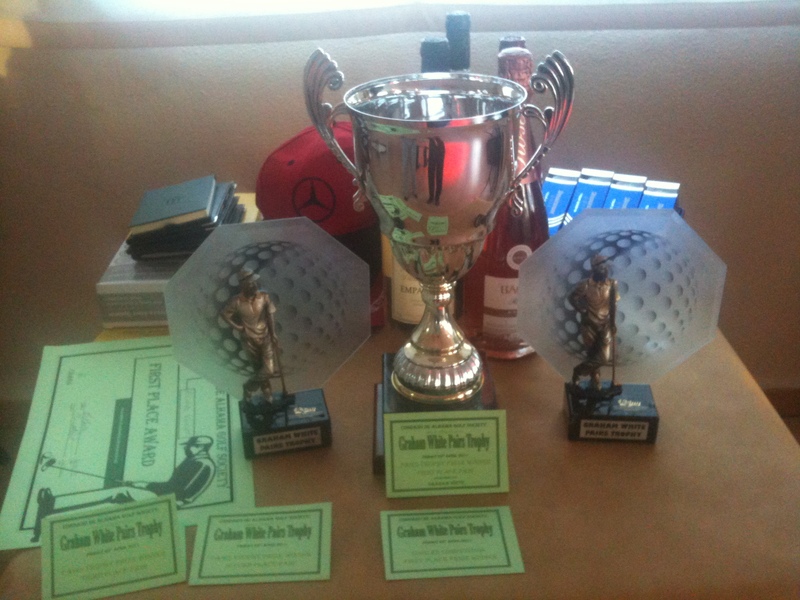 Olagolf have offered a trophy and prizes, and our Olagolf members will play at the Condado price (7 euros). On April 18th there will be a professional tournament at Condado. 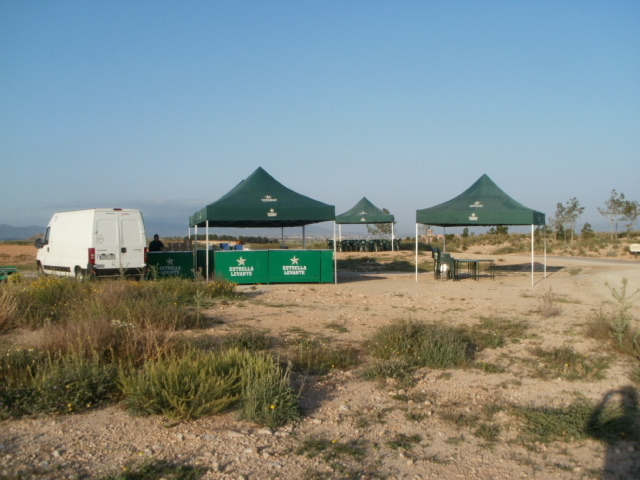 The Murcia branch of the Spanish PGA will play our course and we hope all this adds to the pressure for a clubhouse which is still showing no signs of commencement. golfsales@pgmpromo.co.uk or phone 0044 01274 633978. The website is http://www.pgmpromo.co.uk. He donates 10% of all sales to our society. On Friday we ran our first fund raising event the bonus ball. 49 numbers which will be sold Monday, Wednesday, Friday for the Saturday draw which is televised live. 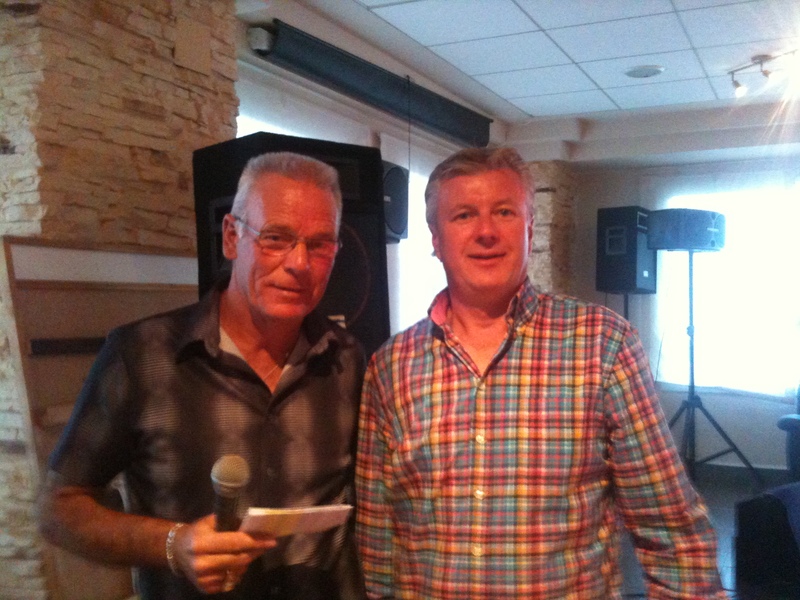 This weeks winning number was 25 which made 40 euros for Borre Hagen. I am going to England for a few days but will be back next weekend with more news.